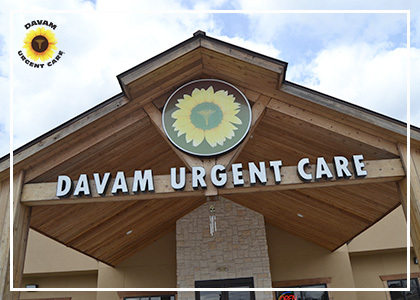 Davam Urgent Care located near Conroe, TX offers a wide variety of walk-in medical services for patients of all ages. In addition to seeing patients ranging from children to adults, we also offer convenient hours of 8am-9pm, 7 days a week. Patients may check-in online to reserve a same day visit time, and allow for a much more efficient urgent care experience. Wait times are typically under 10 minutes at our family clinic located near Conroe, TX. Davam Urgent Care offers many other services in addition to providing treatment for a wide variety of medical illnesses and injuries including EKG’s, drug screening, and more. Sports physicals, school physicals, digital x-ray, on-site lab services, TB test, tetanus shots, and flu shots are also offered as well. We accept prompt pay payments and most insurances to help keep costs down. Visit www.davam.com/insurance for a complete list of insurances accepted at Davam Urgent Care and more information on prompt pay pricing. For more information on Davam Urgent Care please contact (281) 583-1980. Our family clinic services the Conroe neighborhoods of Barton Woods, Stewarts Forest, Grand Central Park, Laurel Ridge, Montgomery Creek Ranch, Jacobs Reserve, River Plantation, Rivershire, Wedgewood Falls, Cut & Shoot, Walden Estates, Greystone Hills, Deer Trail, Fosters Ridge, Acorn Hill Estates, Canyon Creek, Cedar Woods, Harper’s Preserve, Longmire on Lake Conroe, and more.